Denise has been a Sweet Adeline since 1985 but her interest in barbershop music dates back many years before that when as a child her parents took her to barbershop shows in Regina. Having musical parents, Denise grew up with music and harmony in her life. Sitting between a bass and an alto at church gave her no option but to learn how to harmonize. 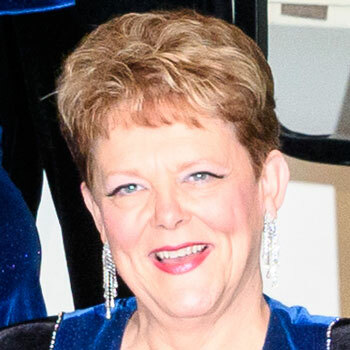 Since that time Denise has served in many capacities in the chorus – President, Vice-President, Secretary, Treasurer, Bookings, Nominations, Social Committee, Competition co-chair for St. Louis, San Antonio, Greenville and Nashville as well as many other committees. She was also the Chair of the Regional Convention and the Competition Coordinator for conventions in Regina. During most of those years, she was also on the music committee serving as baritone section head and Associate and Assistant Director. She became the chorus director in January 2010. Denise has also received the “Spirit of 26” award for Region 26 as well as the “University of Regina Award for Excellence in Administrative and Support Services”. Denise retired from the University of Regina after 35 years.